A University of Chicago police officer stands watch outside the Booth School of Business on April 5, 2018, as students and community members rally in response to the shooting of a student by a UCPD officer that occurred two days earlier. The off-campus shooting of a student by a University of Chicago police officer this week revived questions about how police respond to mental health crises and the role the university’s private police force plays in the neighborhoods surrounding the South Side campus. The shooting comes at a time of sharply stepped-up vehicle and pedestrian stops by the University of Chicago Police Department that, according to analysis by The Chicago Reporter, falls most heavily on African-Americans. On Tuesday night just after 10:15 p.m., UCPD officers responding to a call of a burglary in progress in the alley between Kimbark and Woodlawn avenues near 53rd Street came across a young man shouting, cursing and wielding a long metal tent stake, according to a statement from the university. On a dashboard camera video released by the university, an unidentified officer can be heard saying “he’s a mental.” Body cam video then shows the man running in the direction of an officer, who orders him to stop, and then fires one shot. Charles Thomas, 21, a fourth year student at the University of Chicago was taken to Northwestern University Hospital, where he was in the intensive care unit, his mother told the Chicago Maroon Thursday. Thomas identifies as a person of color who has both black and Asian ancestry, his roommates said. He is on the crew team, works as a guard at a campus museum and was in the process of finishing his thesis about CIA interventions in Latin America, which was due Friday, said his roommate, Daniel Lastres. Lastres said he thought the pressure surrounding Thomas’ thesis might have contributed to the episode on Tuesday night. He said Thomas had been pulling all-nighters and reworking whole sections of the paper in recent days. 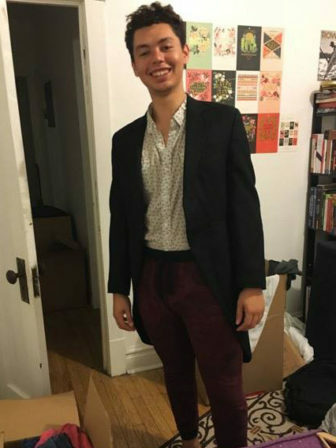 A spokeswoman for the University of Chicago did not respond to questions and the university did not confirm whether or not Thomas was in the midst of a mental health crisis. But a spokeswoman told the Chicago Tribune the officer who shot him had been trained in Crisis Intervention Team training, in which officers learn how to de-escalate certain types of mental health crises. For years, some residents of Hyde Park, Kenwood and Woodlawn have complained about racial profiling by UCPD officers while others have praised the department’s quick response times and the added security of having two police departments patrolling their neighborhoods. 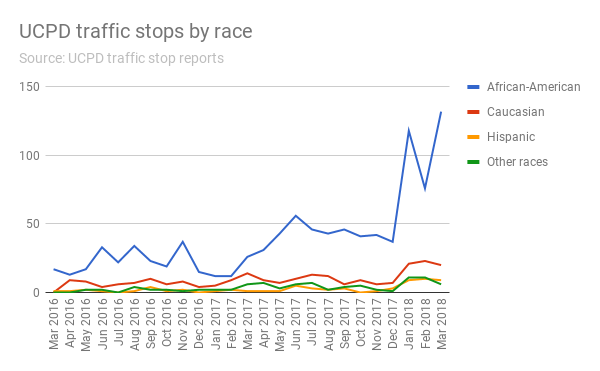 A Reporter analysis of new UCPD data shows that both pedestrian and traffic stops increased significantly in early 2018, affecting African-Americans disproportionately. UCPD has also been increasingly aggressive with vehicle stops. In the first three months of 2018, UCPD officers stopped 446 drivers, more than four times as many as they stopped in the same period in 2017 and more than they stopped in all of 2016. Nearly three-quarters of the drivers stopped were African-American. 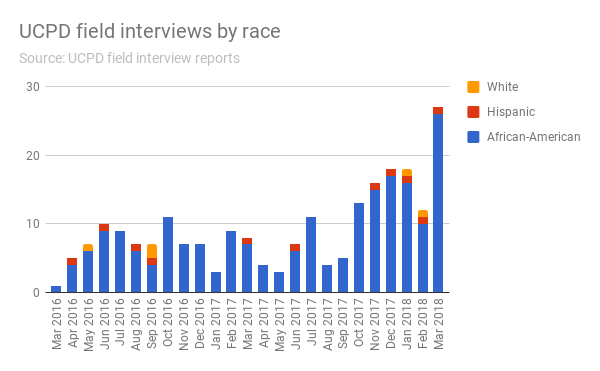 The racial disparities in field interviews are even more dramatic than they are for traffic stops: 93 percent of field interviews conducted were of African-Americans. A review of UCPD incident reports shows that the number of crimes reported to UCPD has remained relatively steady. A university spokeswoman did not respond to emailed questions about what may have caused the spike in stops or whether UCPD has changed its policies around stops. UCPD is one of the largest private university police departments in the country, with more than 100 sworn officers, according to its website. An agreement with the City of Chicago allows UCPD to patrol a 3.5-square-mile area that is home to approximately 65,000 people and extends far beyond the boundaries of U. of C.’s campus. As a private university police department, UCPD is not subject to the same transparency and accountability as municipal departments. A state bill introduced in 2015 that would have subjected UCPD and other departments like it to public records laws died in committee. 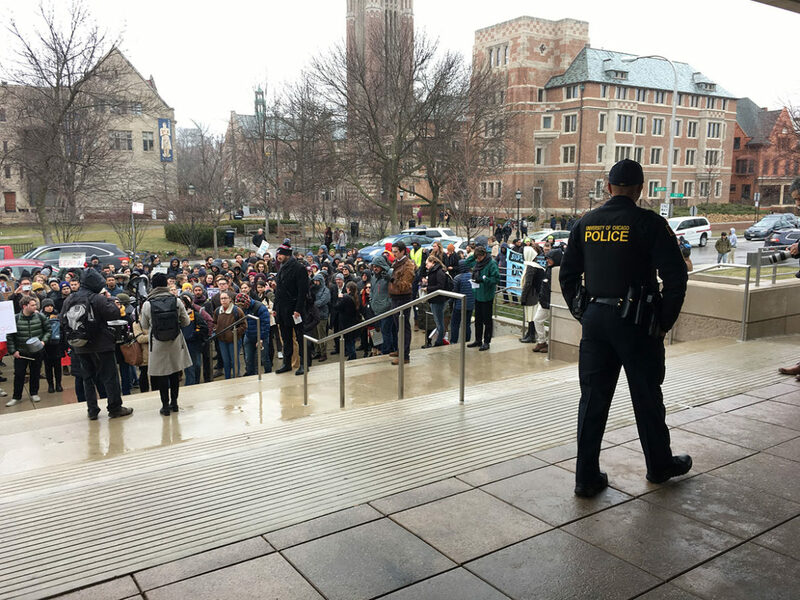 On Thursday evening, students and community members rallied on campus demanding the university pay greater attention to mental health care and hold the officer who shot Thomas accountable. Four university faculty and staff members, including renowned local poet and sociologist Eve Ewing, wrote an open letter Thursday in the Chicago Maroon, the student newspaper, linking Thomas’ shooting to broader issues of police violence, mental illness and UCPD’s lack of accountability. Lastres said he blames the university not only for the shooting, but also for failing to provide adequate counseling and mental health services for students. Perhaps the police are stopping the most llikely suspects.